Be the first to share your favorite memory, photo or story of Anna. This memorial page is dedicated for family, friends and future generations to celebrate the life of their loved one. We ask on behalf of the family that you keep your comments uplifting and appropriate to help all who come here to find comfort and healing. 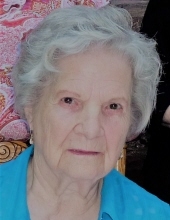 CHARLES, Anna Marie - Age 88, of Holland, formerly of Fenton, died Friday, September 7, 2018. Funeral services will be held 1 PM Tuesday, September 11 at Sharp Funeral Homes, Fenton Chapel, 1000 Silver Lake Rd., Fenton. Pastor JC Hager officiating. Interment will follow in Oakwood Cemetery, Fenton. Visitation will be held 11 AM until the time of service on Tuesday. Those desiring may make contributions to the American Society for the Prevention of Cruelty to Animals (ASPCA). Anna was born May 9, 1930 in Paw Paw, Virginia the daughter of Claude and Sadie (Estep) Conn. She was married to Hubbert Charles who preceded her in death in 1994. Anna was the former owner of The Hammond Home, Tipsico Manor, and other Adult Foster Care Homes. She was an avid reader, enjoyed gardening, and loved the Lord. She had volunteered at the Holland Library. Surviving are: 5 children, Herbert (Teresa) Charles of Holland, Dr. David (Karen) Charles of Linden, Beth Ann Charles of Holland, Tina (Raj) Singh of Sonoma, CA, and Karrie Sue Charles of Holland; 7 grandchildren; and 7 great-grandchildren. To send flowers or a remembrance gift to the family of Anna Marie Charles, please visit our Tribute Store. Share memories & photos, send flowers, and much more. Or sign in using your email address. To send to multiple recipients separate emails with a comma. "Email Address" would like to share the life celebration of Anna Marie Charles. Click on the "link" to go to share a favorite memory or leave a condolence message for the family. Your loved ones's event location successfully sent. flowers from our local florist. No thanks, please don't show me this again.